If neither the Republicans nor the Democrat have the majority in the Senate – the political power will be in the hands of FIVE (5 !) Independent Senators! To achieve this goal all political forces not affiliated with neither the Republicans nor the Democrats need to work together! This approach has never been used in the American politics. However, there is a first time for everything! Hi, fellow 3d-party-er or Independent! For many decades, people have been telling you – “You are a joke; you will never have a political power”. I believe the time has come to prove all those people wrong. I believe the time has come to all 3d-partiers and active Independents to finally rise up, and seize the real political power. Everyone who does not trust neither the Republicans nor the Democrats in their ability to govern our Country is one of us! Add there are also Unions! Many! And everyone is for himself. But, what is stronger, a palm or a fist? We all may have different reasons for not trusting neither of the two major parties. Based on the 2016 elections, and the following events, I believe that – at least in Washington – most Republicans are generally smart but evil, and Democrats are generally nice but stupid (or dumb, or choose whatever word you prefer to describe their inability to think). And both parties are in the pocket of big money. And I believe, that there are millions and millions of people, who see the things the same way. We are ready to become an actual political force – the third force! We are ready to become an actual political movement. But first, we need to agree on the basic principles of our movement. 1. We need to agree that not now, nor in foreseeable future, there will be no third-party president. We have to be reasonable. We have to be pragmatic. The presidency is not our immediate goal. 2. If the presidency is not our goal, how else would we gain political power? The answer to this question may seem counterproductive. We need to gain such a number of seats that neither the Republicans nor the Democrats would have the majority of votes. Currently the House of Representative is split between 241 Republicans and 194 Democrats; and the Senate is split between 52 Republicans and 48 Democrats. Our first goal is to take down 3 (!) Republican senators. Hence, we have to participate in the upcoming 2018 elections. Our candidates will have to run in every possible election. We do not have to win all of them. We need to win just enough to make both – the Republicans and the Democrats – the minority in the Senate; in the House, and in as many legislative bodies as possible. That will make us – the 3d-forcers (i.e. 3d-partiers and active Independents) – decision brokers. That will make us decision makers. Not a single decision will be able to pass without our vote, without our approval. The representatives from both parties will have to talk to us, and we will make them talk to each other! We will act like that family mediator who makes a husband and a wife to finally agree on something (you can choose who is who in this analogy). For at least a decade, American people have been calling on the both parties in Washington to stop fighting and to start working together for the benefits of the whole America. Unfortunately, it has not happened. 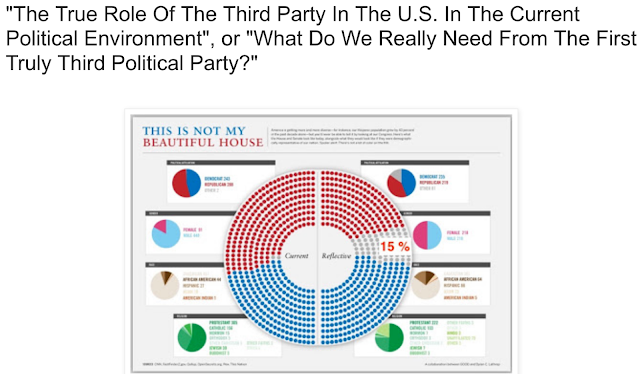 I am absolutely convinced, that there is no chance of seeing the Republicans and the Democrats working together – unless the third strong political force will make them (! ); unless the third strong political force will scare them. 3. To follow this strategy, we – the 3d-force members – should present our candidates against the Republicans and the Democrats (to test and to show the force) in all possible elections. Even if our candidate will not be getting enough voices to win the election, we still will be presenting a strong political power by attracting the voters who do not want to give their votes to neither out of the two major parties! Imagine, that two or three weeks before November 8th, Jill Stein and Gary Johnson would say to their followers: “I know, I will not be the President of the United States. And I vow to you, that the fate of my country is much more important than my personal fate. That is why today I end my run, and I ask all of you – my fellow supporters – to vote for Hillary Clinton”. I have no doubt that in this scenario Hillary Clinton would have become the president. Those few million votes would be enough to change the course of the election. And we can use this strategy for every future election. We may not be able to say any time soon – “The 3d-force gave to the Country the President”. 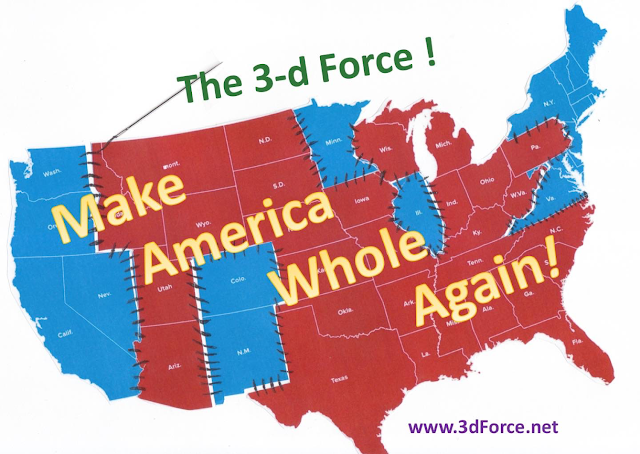 But we will be able to say very soon – “The 3d-force made the Country’s President”! 4. My next statement may seem contradicting everything I just said before. At this point in the history, we don't even need to launch a new additional party. We already have so many of them! We already have millions of people, who do not want to affiliate themselves neither with the Republicans nor with the Democrats. 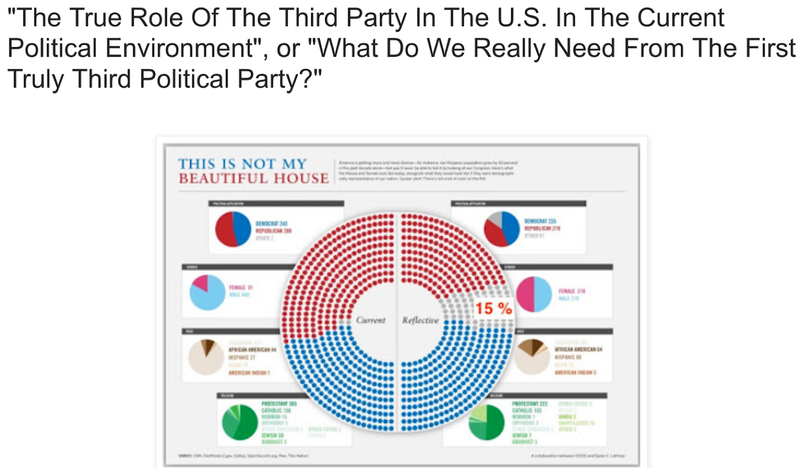 We just need to join our forces – all 3d-parties’ members and all independents who want to actively participate in politics (not just vote on the election day) should form a movement. We need to establish the Massachusetts 3d-parties and Independents Coalition. We need to reach out to all other states and to institute the American 3d-parties and Independents Coalition. 5. Our platform should unite people around the core principles this Country was founded on. It is not right, when people have to work 60 – 80 hours a week, and still live from a paycheck to a paycheck, barely making a living. It is not right, when people cannot afford a medication which would let them have active and accomplished life. It is not right, when the job market shrinks, but at the same time the same few people get richer and richer, and the rest of the country gets closer and closer to the poverty. It is not right, when having a good education means diving into the debt hole till the rest of the life. We are against of elitism and extremism in any form. We truly believe that “All men are created equal”. Our platform should be simple but sound. Make America Fair for All! Take Lying Out of Politics! When Rich Bend Rules, We Straighten Them Back! The Republicans and the Democrats in Washington have lost sight of their purpose; they are stuck in the war of ideological dogmas; they are clung to old social, political, and economic models, which obviously do not work anymore. Having the minimum wage close to $15 an hour is a good idea, but where would money come from without damaging the economy as a whole? Slowing down the negative effects of the climate change may put some pressure on businesses, but the alternative is to risk the mere existence of all the businesses. The Country badly needs a tax reform, a health insurance reform, a manufacturing reform, an educational reform. The problems at hand have become so complicated and large, that easy solutions simply don’t exist. Every single idea – as long as it helps people to live and prosper – is on a table. Nowadays, all mass media make everyone think that there is an ideological war between liberals and conservatives; that liberal values and conservative values are incomparable, internally contradictory to each other. However, no one has to choose between individual freedoms and an efficient government, or between the health of the nation and the prosperity of its businesses. The choice everyone needs to make today is between truth and facts, against fiction and leis; between realistic, pragmatic solutions, and dogmatic ideology and wishful thinking; between having an open and honest talk with people, against hypnotizing rhetoric and manipulating peoples’ minds. We will prove that liberal conservatism (or conservative liberalism) can exists. We will prove that such ideals as freedom of speech, freedom of enterprise, efficient governing, and pursuit of happiness for all can coexist. But in order to restore those ideals and preserve them from erosion, we have to be smart and pragmatic, firm and inclusive. We need to bring to the same table people with opposite views, and make them talk to each other, guiding that conversation away from an ideological war of words toward pragmatic solutions benefiting the whole Country. This will be our political mission (at least for the close future). 6. No one knows yet, if in the future our Coalition will make the transition from being a movement to becoming an actual political party. There is no way to predict this today. But I can predict that the American 3d-parties and Independents Coalition will become a formidable political power very soon. 5. we need to make the movement official, set up state meetings, set up a unifying national convention, and present our candidates for all (ALL!) upcoming elections. In 2016 Presidential elections 65,844,969 voters went Democratic, 62,979,984 voters went Republican, but 7,627,197 people (close to 6 % of all who voted; or 12 % of who could have been voting for a certain party candidate) voted for a third force. Many people did not even vote at all because they did not trust neither the Republican nor the Democrats, but did not see a strong third choice. The American 3d-parties and Independents Coalition will give to all American voters a viable third choice. The year of 2018 will be our test drive year. The year of 2018 will be our year! If you want to join or to support the movement, or to volunteer, please send me an email. Some intro about who I am. This link http://www.gomars.xyz/vv.htm leads to more on my professional experience. (I am NOT a Russian spy :) ! ). I have been living a quiet life of a math and physics instructor, until Vladimir Putin has essentially chosen my new President (at least, so I think so far). I have been posting my thoughts on the matter on my blog. All those posts represent my life philosophy, my political views, my ideals and dreams. Conservative Liberals– future Porgs of the political America. Scott Greer’s Terrible understanding of John Oliver’s piece on slavery. Make America Whole Again! The 3-D Force in politics. Can we curb gun violence? Who are the real wealth creators? 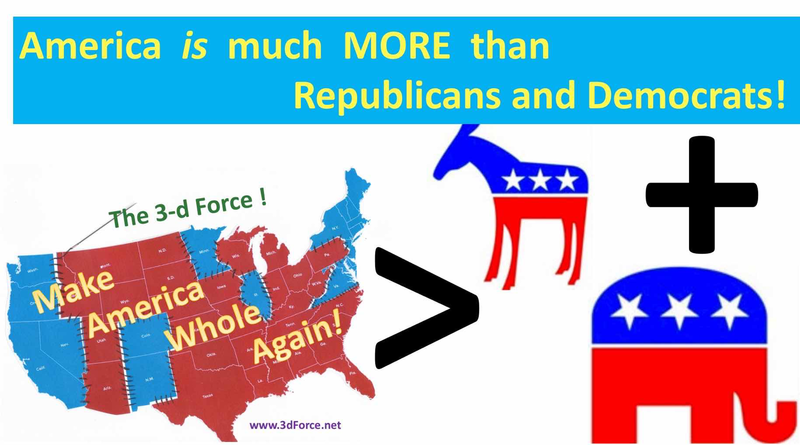 Why Should the Democrats Support The 3-D Force? When will the Democrats make the first step of the 12-step program (admitting!)? Seems - never! Peering through the fog of brainwashing: the real reasons behind the conservative politics. Ignoring sloppiness: a sign of tolerance or mismanagement? And how did it affect 2016 election. Why did Hillary Clinton Lose the Race? Or. Conformism and Arrogance of The Establishment. And. What To Do Now? What should really differ a “Progressive” from a “Conservative”? The Challenge for the Democrats - Stop Lagging, Start Attacking! “A failure of imagination” has led to 11/08/2016.